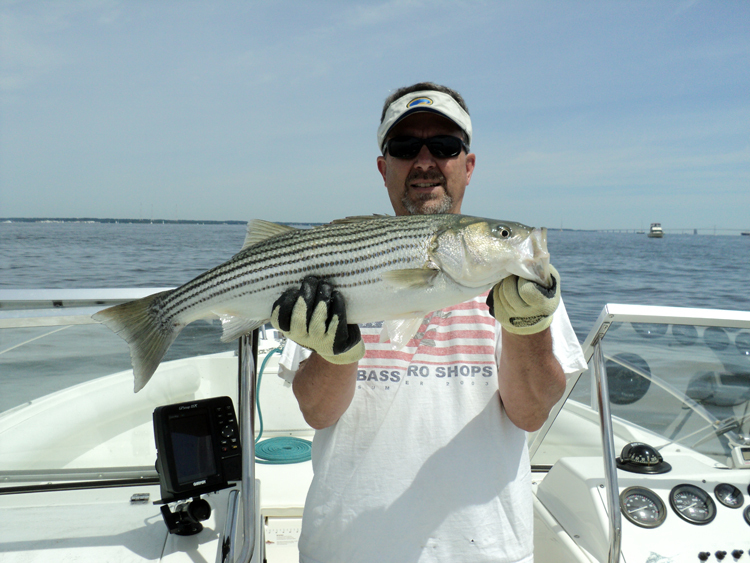 As we enter the first week of June Chesapeake Bay fishermen are seeing all areas of the bay and its tributaries open to Striped Bass fishing entering the traditional summer season. Freshwater fishermen find almost ideal water temperatures for a wide variety of fishing opportunities and warming water temperatures in the coastal areas are bringing in summer species to the region. Fishermen are enjoying new fishing opportunities in the lower Susquehanna River this week now that the entire river is open to Striped Bass fishing all the way up to the dam pool. There are plenty of Striped Bass around and fishermen are catching them by casting swim shads, jigs, crankbaits as well as live lining eels and White Perch. The White Perch fishing in the lower river continues to be excellent and most fishermen are casting shad darts, small spinnerbaits or extra heavy spinners. Flathead Catfish are ready to give anyone a tussle near the dam pool on fresh bait or heavy swim shads and Channel Catfish are plentiful throughout the entire upper bay region. White Perch are also plentiful in the other tidal rivers of the upper bay region and can provide excellent fishing opportunities since water temperatures are nearly ideal for shallower areas close to shore. Structure such as old piers, channel edges and hard bottom are all great places to jig, cast spinners or use bottom rigs with bait. The Baltimore Harbor area, Hart-Miller Island and similar areas offer good fishing opportunities this time of the year while water temperatures are still in the low 70’s. There is some Striped Bass action being reported at traditional upper bay chumming locations such as Swan, Love and Podickory Points with some of the better success being found with fresh baits being allowed to sink to the bottom far back in a chum slick. Trolling along channel edges and similar structure is being described as a slow pick for fish in the 18″ to 26″ size range. The Bay Bridge piers is a good place to start fishing if you’re launching a boat near by and the piers, rock piles and the sewer pipe are producing fish for fishermen jigging, chunking or live lining Spot. The inside of Hackett’s Bar, which is just below the bridge on the western shore, has been a good place to put together a supply of live Spot this week plus a mix of croaker and White Perch. The outside edge of Hackett’s is providing a good place to also live line those Spot for Striped Bass. Other fishing opportunities below the Bay Bridge include traditionally popular places to live line or jig such as Thomas Point, the Hill and channel edges on both sides of the bay. Eastern Bay continues to hold a lot of bait and jigging over suspended fish or under breaking fish continues to be a good option. The rocks near Poplar Island have also been a good place to cast a variety of lures during morning and evening low light conditions. Trolling along both sides of the bay and Eastern Bay has been good despite the recent May Worm swarms and small to medium sized bucktails and swim shads behind umbrella rigs or in tandem have been effective. Herb Floyd holds up a nice 26″ fish caught while trolling this past weekend. In the middle and lower bay regions fishermen are finding breaking fish along the edges of channels in the bay and lower sections of tidal rivers. Casting soft plastics or bucktails is a fun way to fish and allowing jigs to sink underneath the surface action usually puts one into a larger grade of fish. Bluefish have yet to make the scene in the Maryland portion of the bay so soft plastics are still safe for jigging and trolling. Live lining spot is taking off in a big way this week now that it is relatively easy to find Spot and the 35′ deep channel edge out in front of the Gas Docks is living up to its reputation as a great place to live line those Spot. Fishermen should never forget to explore any good looking channel edge or structure wherever they are on the bay or any of the tidal rivers for Striped Bass. The satisfaction of finding one’s own secret spot is one of those fun and rewarding facets of fishing. The lower Patuxent River and especially the lower Potomac are reported to be offering good to excellent fishing for Striped Bass by trolling, jigging, live lining or casting. Black Drum continue to attract the attention of a select group of anglers looking for a heavy duty fight. A soft crab bait continues to be the bait of choice but often prove hard to acquire lately. The traditional areas such as the Sharps Island Flats area continue to be a popular place to give this “drop it on their head” type of fishing but there is always the surprise of hooking up with one of these beasts while croaker fishing. Shallow water fishing could be described as being at it’s zenith in many areas of the middle and lower bay this week. Water temperatures are in the low 70’s and Striped Bass are cruising the shallows near points and areas with good water exchange along bay shores and tidal rivers and creeks. Casting swim shads and a variety of other lures is a relaxing and fun way to fish with light tackle. 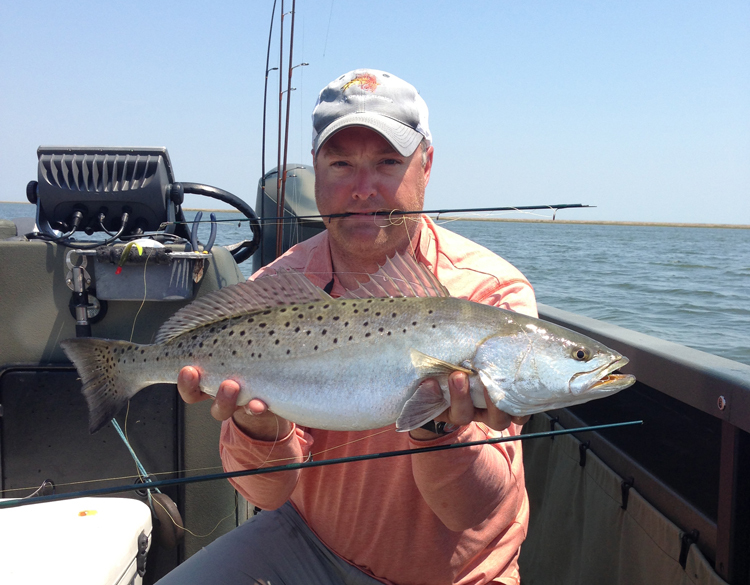 Speckled Trout are a big part of the mix especially on the lower eastern shore with most being 20″ or better and Red Drum over 18″ have also been a very welcomed addition for some lucky anglers. Jeremy Mercer holds up a nice Speckled Trout he caught on a jig in the Honga River recently. White Perch are now a big part of the shallow water fishing action around shoreline structure for fishermen casting spinners and jigs whether in a boat or the shoreline. White Perch offer some great fishing opportunities for young fishermen when fishing from docks; often the best fishing is right next to the dock and fishing with grass shrimp on a bottom rig or bobber is hard to beat. Fishing for croaker has improved this week in most areas of the middle and lower bay and they mix in well with White Perch, spot and Channel Catfish; in the lower Potomac medium sized Blue Catfish often out number the croaker. Recreational crabbers are finding their success improving ever so slowly each week as the season progresses. Small and light crabs are a big part of talk among trot liners and collapsible trap crabbers during this early segment of the season. The best crabbing reports are coming from the lower bay tidal creeks and rivers; especially on the lower eastern shore. Freshwater fishermen are reporting some fun fishing in many of the trout management waters in the western and central regions this week. The crowds have thinned, water temperatures are still cool and there are trout. Fishermen are still using bait in the put and take areas but many have switched to lures such as spinners to cover more water and maybe entice a big one to strike such as this whopper caught by Ethan Fike at Lions Park Pond in Frostburg while fishing with his dad. 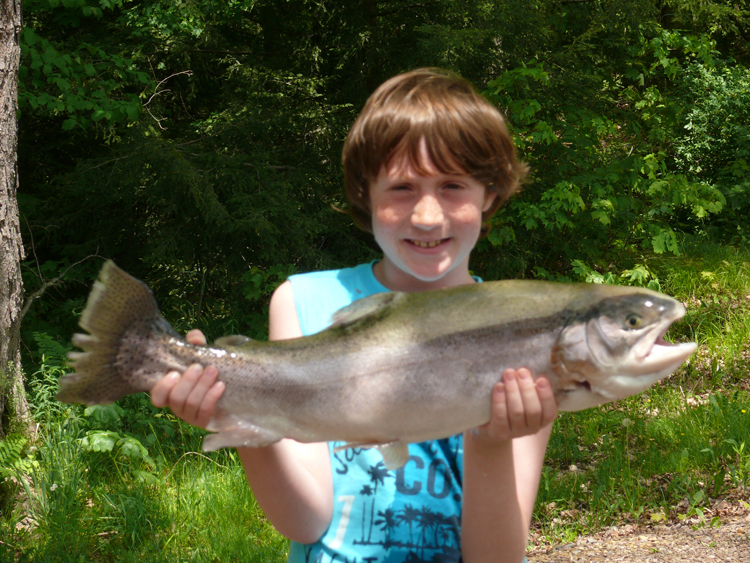 His father drove Ethan to the Bassin Box award center in Lavale where Ethan registered his award certificate qualifying trout into the Maryland Fishing Challenge. We hope to see Ethan at the award ceremony on September 7th at Sandy Point State Park and hopefully he may win the boat, motor and trailer prize or perhaps the world destination fishing trip so he can take his father fishing. This is the best of times for Largemouth and Smallmouth Bass fishermen as ideal water temperatures and post-spawn behavior has fish in an aggressive feeding mood. Fishermen report that shallow grass and structure such as spatterdock fields and brush or fallen tree tops offer great places to try for Largemouth Bass that are poking around these areas looking for small baitfish or crawfish. Topwater lures, spinnerbaits, soft plastics and shallow running crankbaits are all good choices to use. Smallmouth Bass can be found in selected areas of the central region such as the lower Susquehanna River, Liberty Reservoir and Prettyboy Reservoir. Deep Creek Lake and the upper Potomac River hold excellent fishing opportunities for Smallmouth Bass this week in the western region. Tubes, swim shads, crankbaits and live shiners are all good choices for Smallmouth Bass. Ocean City area fishermen are seeing surf water temperatures rise above 60-degrees this week. Surf fishermen are still catching large Striped Bass in the surf on menhaden or clam baits along with large numbers of Cow-Nosed Rays, dogfish and Black Tip Sharks and a few large Bluefish. A mix of Kingfish, Spot, sea trout and blowfish can be caught on smaller baits. At the inlet and Route 50 Bridge area fishermen are catching some nice large Striped Bass and Bluefish at night on swim shads, Got-Cha plugs and live Spot; during the day flounder, blowfish, small Bluefish and a few Tautog round out the bill. In the back bay areas flounder fishing remains good with a few sea trout and ever present Cow-Nosed Rays taking squid baits. Sea Bass fishing at the wreck sites remains steady with one or two limits being obtained on each trip on the party boats. Tautog are part of the mix and Fred Brungart of York, Pennsylvania got a surprise last Friday when he brought up what he thought was a big Tautog. 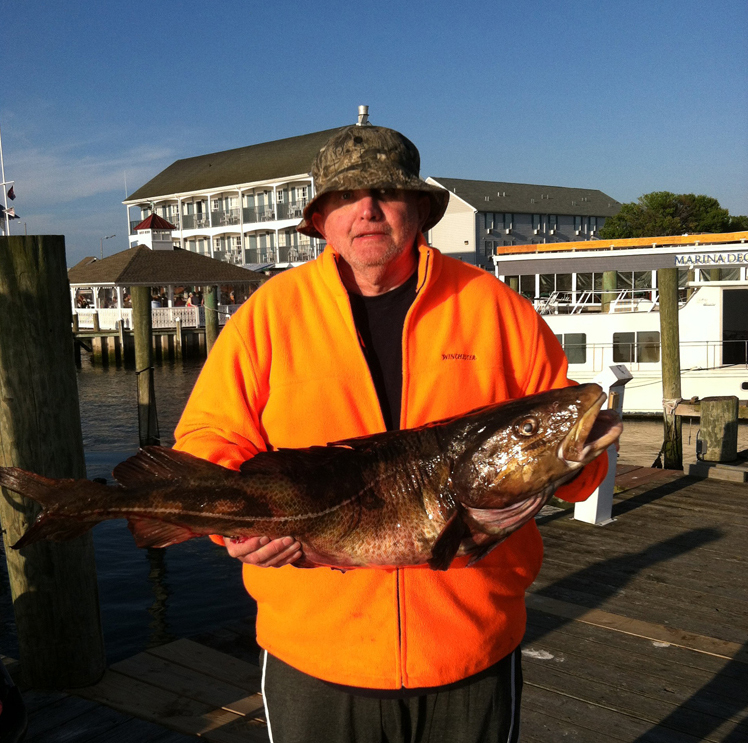 It turned out to be a 24lb Cod Fish which is a pending Maryland state record which fills a category that had remained vacant. Anyone old enough to remember winter time Cod fishing in the late 50’s may remember fish of this size being common and pool winners often in the 50lb to 60lb class. Hopefully Fred’s Cod is a harbinger of a dearly missed fishery that may make a comeback. Fishermen have been heading out to some of the traditional 30-fathom lumps such as the Hot Dog, Fingers and even the Hambone, which is a little shallower, are catching a mix of Blue Sharks, Makos and Thresher Sharks this week. No real whoppers have been reported yet but there is some action to be had. There is a pending world record mako submission of a 1,325lb specimen caught off of California. For any fishermen there is always that eternal hope that you just never know what you might catch when you cast into the vast waters of the ocean.